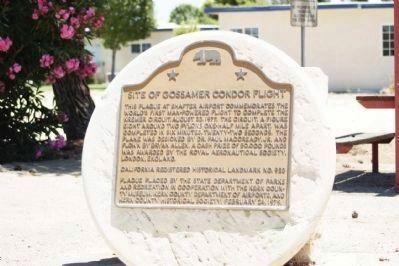 This plaque at Shafter Airport commemorates the world's first man-powered flight to complete the Kremer Circuit, August 23, 1977. The circuit, a figure eight around two pylons one-half mile apart, was completed in six minutes, twenty-two seconds. 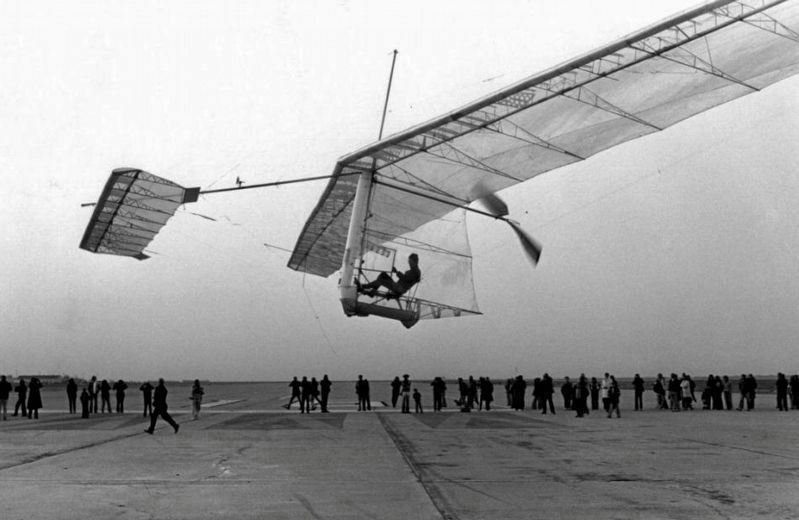 The plane was designed by Dr. Paul MacCready, Jr. and flown by Bryan Allen. A cash prize of 50,000 pounds was awarded by the Royal Aeronautical Society, London, England. Location. 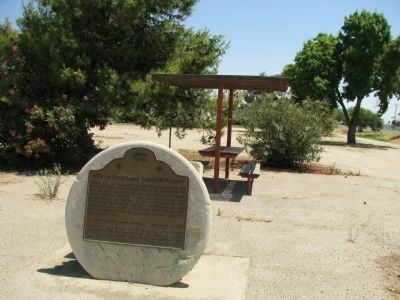 35° 30.007′ N, 119° 10.898′ W. Marker is in Shafter, California, in Kern County. Marker is at the intersection of Vultee Street and East Lerdo Highway on Vultee Street. Touch for map. Marker is at or near this postal address: 180 Vultee Avenue, Shafter CA 93263, United States of America. Touch for directions. (approx. 5.9 miles away); Oildale Waits Drilling Company (approx. 10.4 miles away); Oildale, A 100 Years Ago (approx. 11.2 miles away); Sonora Service Station (approx. 11.6 miles away); Hospital (approx. 11.6 miles away); Cook Wagon (approx. 11.6 miles away). Touch for a list and map of all markers in Shafter. This photo is on display at the nearby Minter Field Air Museum. More. 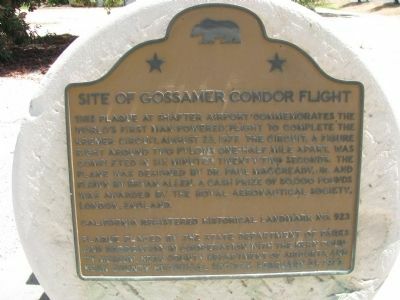 Search the internet for Site of Gossamer Condor Flight. Credits. This page was last revised on March 18, 2019. This page originally submitted on January 30, 2012, by Denise Boose of Tehachapi, California. This page has been viewed 997 times since then and 31 times this year. Last updated on March 12, 2019, by Craig Baker of Sylmar, California. Photos: 1. submitted on January 30, 2012, by Denise Boose of Tehachapi, California. 2. submitted on July 19, 2014, by Mia Kostouros of Los Banos, California. 3. submitted on January 30, 2012, by Denise Boose of Tehachapi, California. 4. submitted on March 11, 2019, by Craig Baker of Sylmar, California. • Bill Pfingsten was the editor who published this page.